A team of researchers from Nijmegen and Manchester have demonstrated that the electrons in transistors and capacitors made from graphene exhibit interactions with each other. Up until now the surroundings messed that up. Graphene, the two-dimensional form of carbon discovered in 2004, is an electrical conductor with surprising properties. However these properties only become apparent if the material has a high purity. Thanks to the enormous technological progress made in recent years scientists can now produce transistors and capacitors based on graphene with an extremely high purity. The properties of these transistors and capacitors are no longer determined by the interaction of the electrons with their surroundings but mainly by the interaction between the electrons themselves. This subtle effect was recently made visible in the High Field Magnet Laboratory (HFML) in Nijmegen, a collaboration between FOM and Radboud University (Nijmegen). Researchers from Nijmegen and Manchester have measured the electrical resistance of graphene transistors and the capacitance of graphene capacitors. The transistors and capacitors consist of atomic layers of conducting graphene sandwiched between two nanometres-thin insulating flakes of boron nitrite. The base materials used are so pure that the electrons in the graphene can move without any hindrance from their surroundings. As a result of this, interactions between the individual electrons become visible. 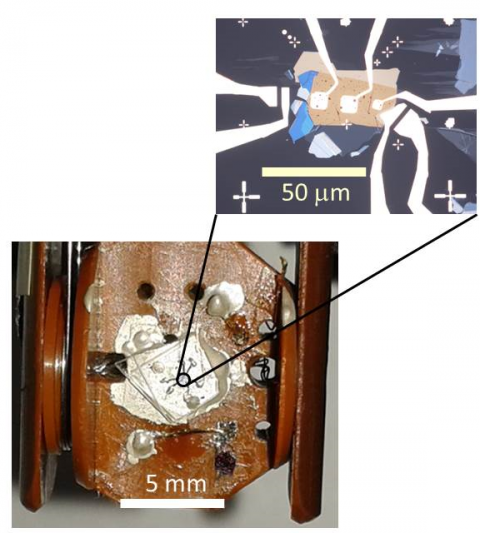 The researchers placed the transistor in a strong magnetic field. They subsequently saw oscillations in the resistance. When they did the same with capacitors they also observed oscillations, but then in the capacitance. The explanation is that the electrons order themselves in discreet energy states, so-called Landau levels. This can still be explained with a simple single-electron model without any interaction between individual electrons. However, for a magnetic field between 10 and 35 Teslas and a temperature of less than one degree above absolute zero, the electron interaction started to mess things up. The Landau levels split up and extra oscillations occurred. These experiments mainly have significance for the fundamental properties of exceptionally pure graphene devices. The scientists still want to gain a better understanding and control of the interaction between the electrons. And then in the future, applications might be possible in new electronics. Set up for the measurement of graphene capacitors in high magnetic fields (up to 38 Tesla) and at low temperatures (down to 0.3 K). The actual device (which can be seen in the 100x enlargement) is located on a quartz substrate (transparent) and is mounted on a rotatable platform. Credits: HFML and University of Manchester.